Click here to save 5% off this item! 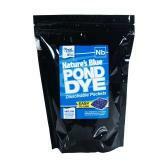 The power of Pond Logic® Pond Dye is now available in a convenient water soluble packet. Our concentrated formula allows 2 packets of Pond Logic® Pond Dye to treat like a gallon of competitive liquid dye. Pond Logic® Pond Dye Packets are available in 2 colors, each with its own unique application. Each shade of Pond Logic® Pond Dye provides the same reliable protection and can be selected based on your personal color preference. • Nature’s Blue™ is the ideal color for decorative ponds as it contrasts perfectly with lush green landscaping. •1 packet treats Approx. 1/4 Acre Pond Surface with a 4 to 6 ft average depth. © 2013 La Brake's Garden Path & Pond. All Rights Reserved.